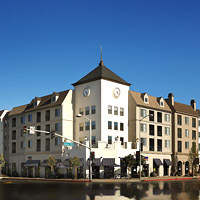 The Gateway is an 86-unit, tax credit building located in the city of Carson, CA for people 55 and over. The waiting list is currently closed. All units include a stove, refrigerator, dishwasher, granite countertops, carpet, central heating and air-conditioning, and a patio or balcony. The property features on-site management and maintenance staff and underground parking. Amenities include a billiards table, computer lab, library, fitness room, laundry room and a spacious community room with a full kitchen and television. Directly adjacent to the community room is a lushly-landscaped courtyard featuring a putting green, fireside lounge and spa. Residents can participates in various activities including monthly parties, health and wellness classes, bingo and field trips. Retail stores and restaurants are conveniently located on the building's ground floor level. The property is within walking distance to public transportation, a community senior center, City Hall and various local businesses.